Silver Dollar Diva (#4) is clearly the horse to beat. Chad Brown is just so dangerous with these types of runners, as evidenced by his 100 TimeformUS Trainer Rating with second-time starters. This filly was really rolling late at Gulfstream in her debut despite having to overcome a slow early pace (indicated by blue color-coding in PPs). If she runs back to that effort, she is probably going to win. However, like last time, there does not appear to be much early speed in this race, so she could be pace-compromised once again. 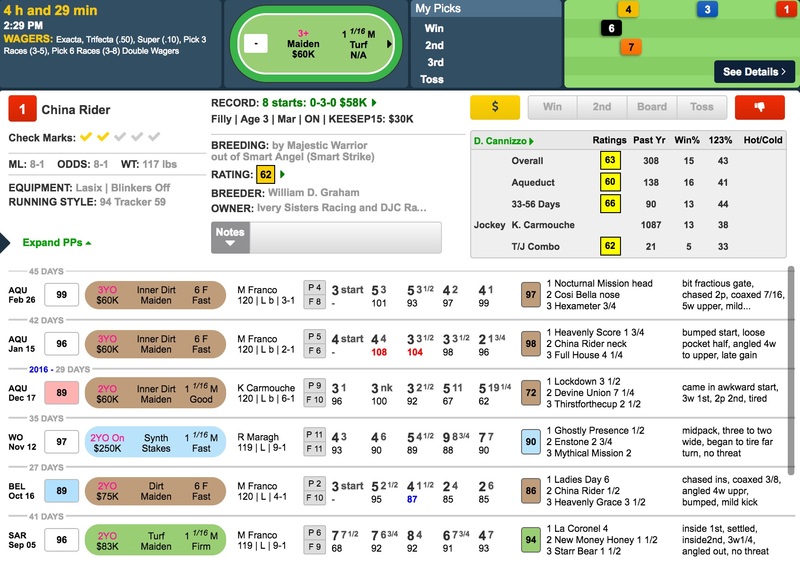 The runner who may be able to take advantage of such a scenario is CHINA RIDER (#1). While not necessarily a front-runner, China Rider has been showing good early speed in her recent dirt sprints, and her rider, Kendrick Carmouche, is acutely aware of pace situations like this. I expect him to send her to the lead from the rail. Furthermore, she actually ran quite well in her only turf start. That race came against the toughest field of turf maidens that was assembled all meet at Saratoga. The top two finishers out of that race have gone on to become graded-stakes winners, and it’s not as if China Rider finished that far behind them.